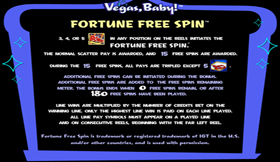 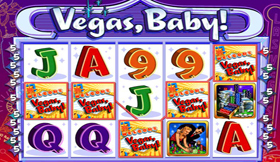 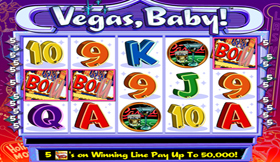 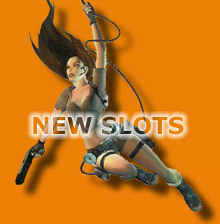 Three or more Vegas Baby Bonus symbols on any of the 5 reels triggers the Vegas Baby Fortune Free Spins Bonus. 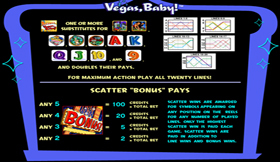 Straight away you earn a lucrative scatter award and then the action really heats up. The sun goes down, the neon sizzles on, and you are on your way to a bonus party starting with 15 free spins. 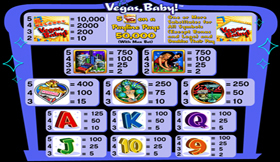 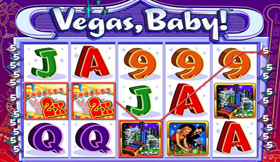 If that's not exciting enough, a 3x bonus multiplier kicks in too - tripling all bonus pays except for five top award Vegas Baby symbols which is a fat 50,000 Jackpot at max bet! 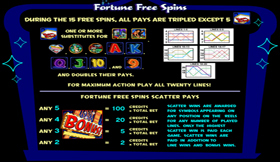 Get three or more bonus scatter symbols during Fortune Free Spin Bonus and your free night on the town just got better, baby, with an additional 15 free spins! 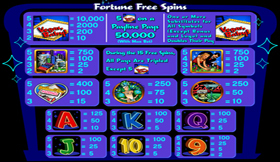 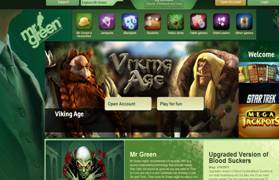 you can keep retrigging the action with up to 180 free spins in a single bonus round.